My name is Nicky Frank. Except, most likely, it isn’t. Nicole Frank shouldn’t have been able to survive the car accident, much less crawl up the steep ravine. Not in the dark, not in the rain, not with her injuries. But one thought allows her to defy the odds and flag down help: Vero. I’m looking for a little girl. I have to save her. Except, most likely, she doesn’t exist. Sheriff’s investigator Wyatt Foster is frustrated when even the search dogs can’t find any trace of the mysterious missing child. Until Nicky’s husband, Thomas, arrives with a host of shattering revelations: Nicole Frank suffers from a rare brain injury and the police shouldn’t trust anything she says. My husband claims he’ll do anything to save me. Except, most likely, he can’t. Who is Nicky Frank, and what happened the night her car sailed off the road? Was it a random accident or something more sinister given the woman’s lack of family and no close friends? The deeper Wyatt digs, the more concerned he becomes. Because it turns out, in the past few months, Nicky has suffered from more than one close accident. . . In fact, it would appear someone very much wants her dead. This is my life. Except, most likely, it’s not. Now watch me crash and burn. "expertly crafted thriller. . . Gardner keeps the reader guessing until the end!" "In this strong addition to the series, Gardner retains her place on thrillerdom’s top tier. Gardner has a reserved seat on most best-seller lists, and she’ll be claiming her spot once again." "When you crack open a book by Gardner you know you are in for an astonishingly twisty tale that will keep you guessing." 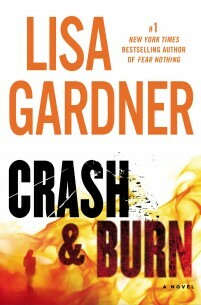 "Lisa Gardner is a superb wordsmith, as she proves with Crash & Burn." "Gardner hasn’t just mastered the psychological thriller form, she now owns it. And Crash & Burn is the kind of rare reading experience that has masterpiece written all over it." "Lisa Gardner delivers another gut-wrenching emotional thriller with her latest psychological tale, Crash & Burn. . . This story is like an onion: Peel away a layer and another aspect of the mystery is revealed." "What is most enjoyable about this novel is its complexity. Lisa Gardner has thought out her plot from beginning to end and is atop every nook and cranny, every twist and turn. She knows when to reveal new information and when to keep it hidden. It is a bait-and-switch type of writing that holds the reader entranced and searching from beginning to end." "Lisa Gardner is in top form here. Crash & Burn is a mind-bending thrill ride."